If one takes the backroad (the D850) from Maltahöhe to Sesriem you will find a very special camp that epitomises the beauty of the Namib-Naukluft area and the hospitality of the people of Namibia. 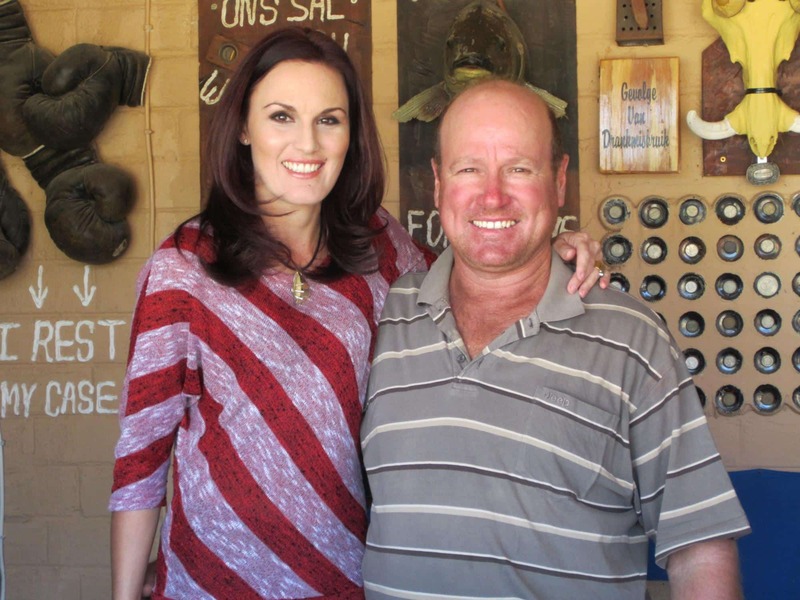 Johan and Nicky Steyn makes their guests feel at home. At the Tsauchab River Camp Johan and Nicky Steyn will really make you feel at home. Right from the entrance one gets the feeling that this is a very special place. Johan looks like a farmer but he is also an unsung artist and an excellent host. His astonishing iron art, created mostly from pieces of scrap metal from the farm, welcomes visitors to Tsauchab River Camp. 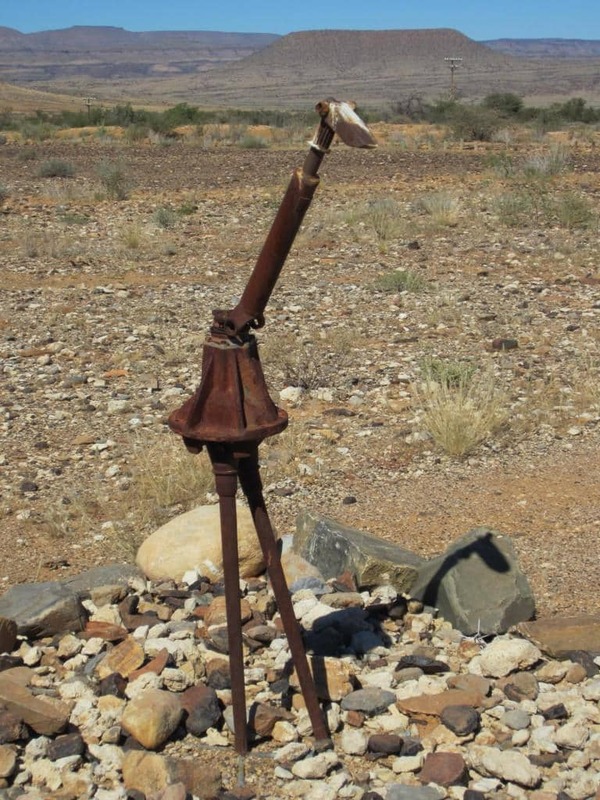 An ostrich made from scrap metal. The Tsauchab River Camp is situated on the Tsauchab River which flows west and abruptly disappears into the red dunes of Sossusvlei less than 130 km from there. For a large part of the year the river is dry but it often happens during the rainy season that they have to evacuate some of their campsites which are situated close to the river. They have four self-catering chalets and ten campsites available on the farm. 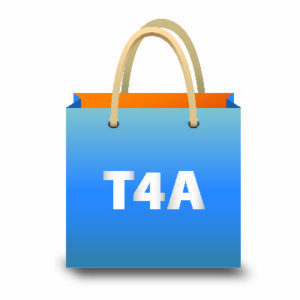 Each camp is exclusively booked out to a group, whether you are two or twenty people. The camps are scattered all over the farm and each one has its own ablutions with hot and cold water. 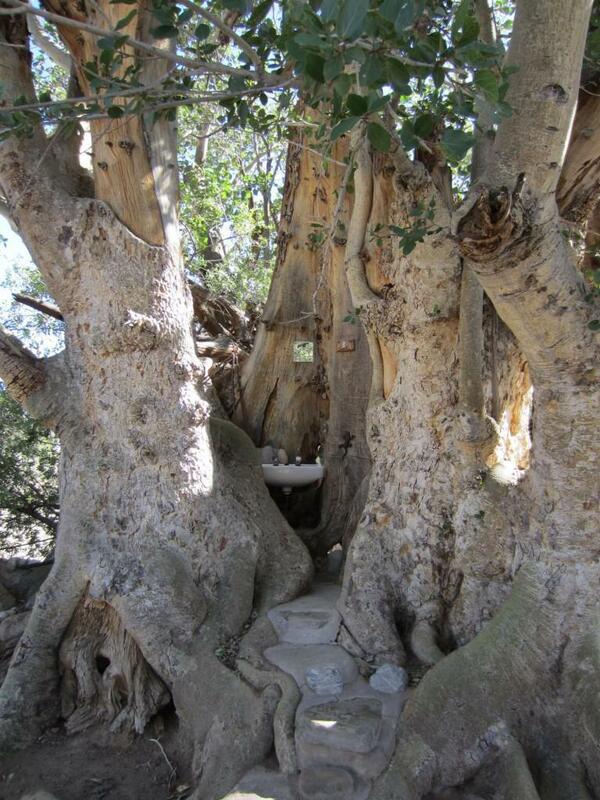 One of the campsites has a shower and basin built into a giant fig tree! Bathroom in a wild fig tree. The entrance to Oerwald camp. 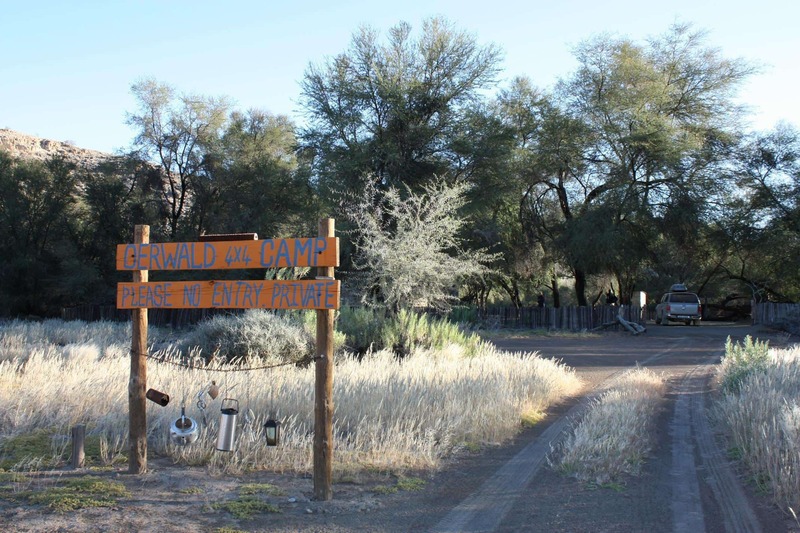 We stayed at Oerwald camp and really appreciated the neat camp, the isolation, the lovely ablution facility and the natural beauty of the area. 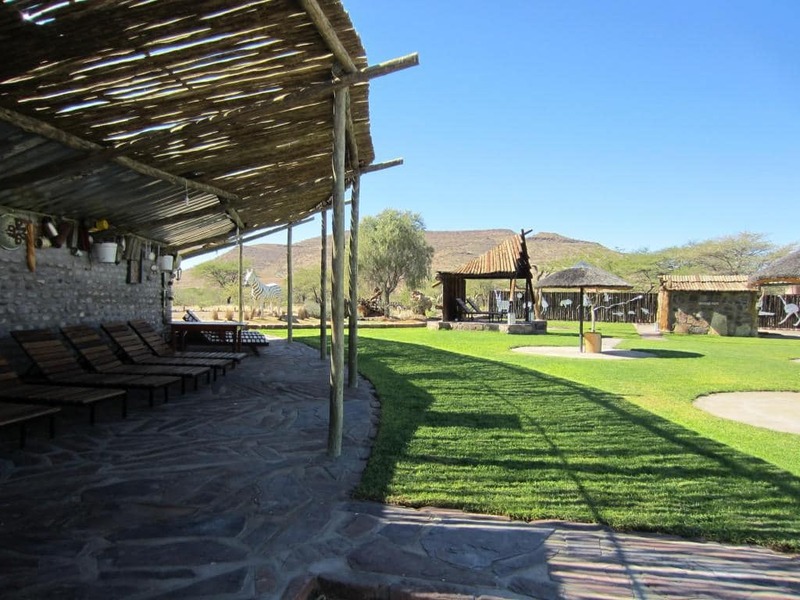 There are various hiking and 4×4 trails on the farm and Johan offers guided trips to sun downer viewpoints and special features like quiver trees and natural springs. On a drive you are bound to spot Hartman’s zebra, kudu, oryx, ostrich, warthog and, if you are lucky, maybe even one of the leopards that roam the mountains. However, you don’t have to drive around to enjoy the wildlife. You can just sit at your campsite and watch a huge variety of birds. 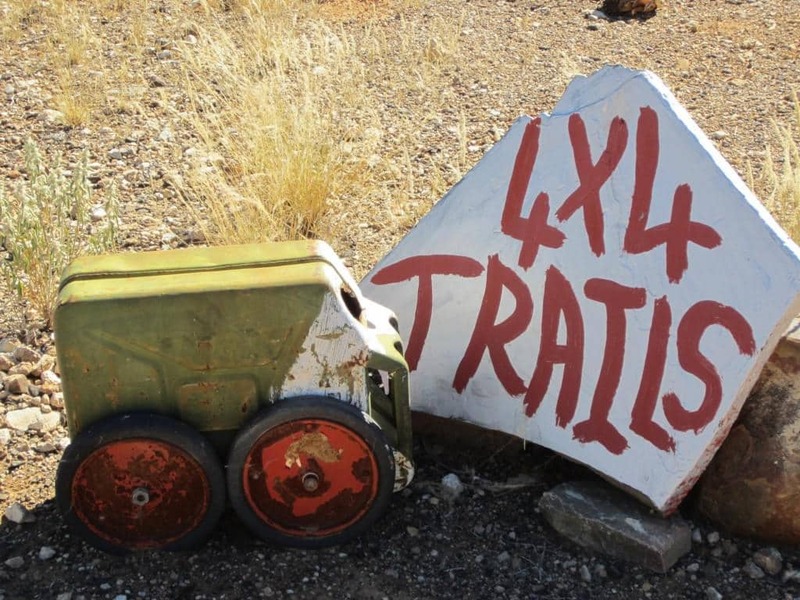 Artwork indicating they offer 4×4 trails. Artwork indicating they have a farm shop. Nicky and her friendly staff offer elegant meals made from fresh produce on request and guests are welcome to cool down in the pool or relax at the bar. 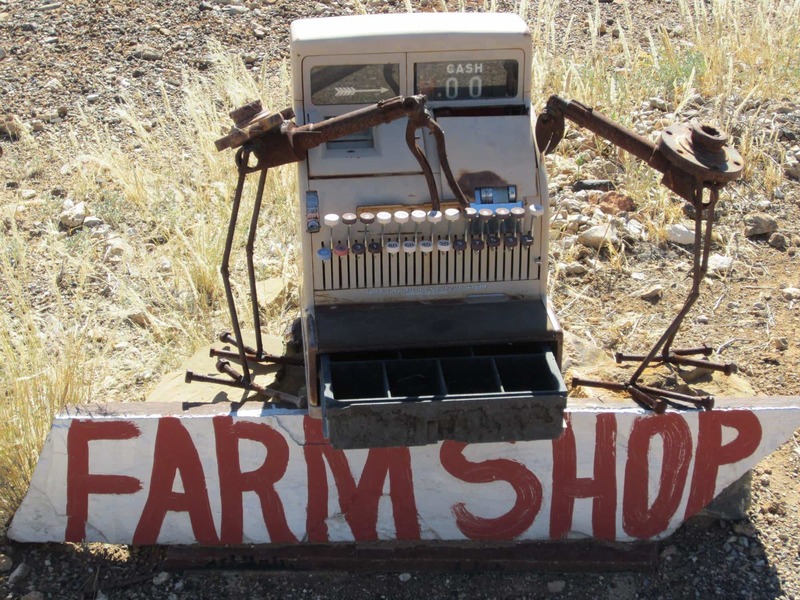 They even have a small farm shop where you can buy firewood and basic supplies. Guests can relax and cool down at the pool area. 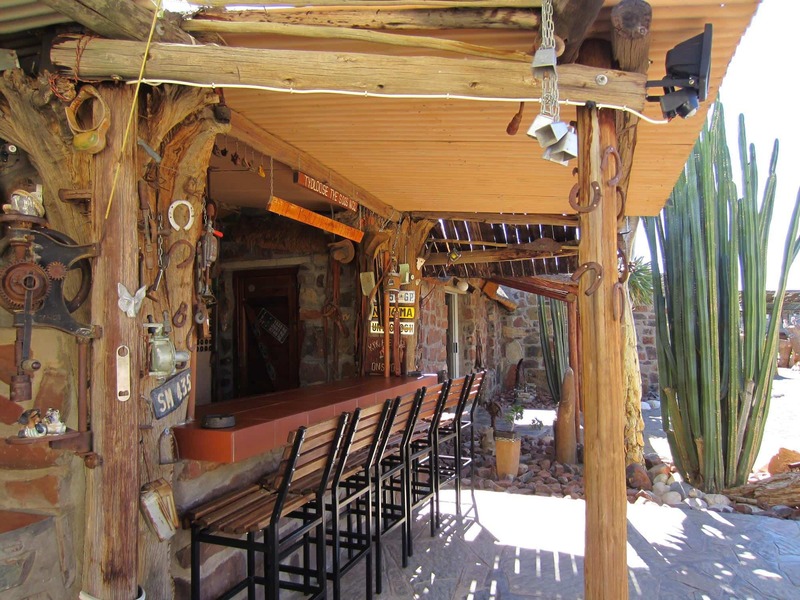 Like everything else at Tsauchab River Camp the bar has a lot of character. 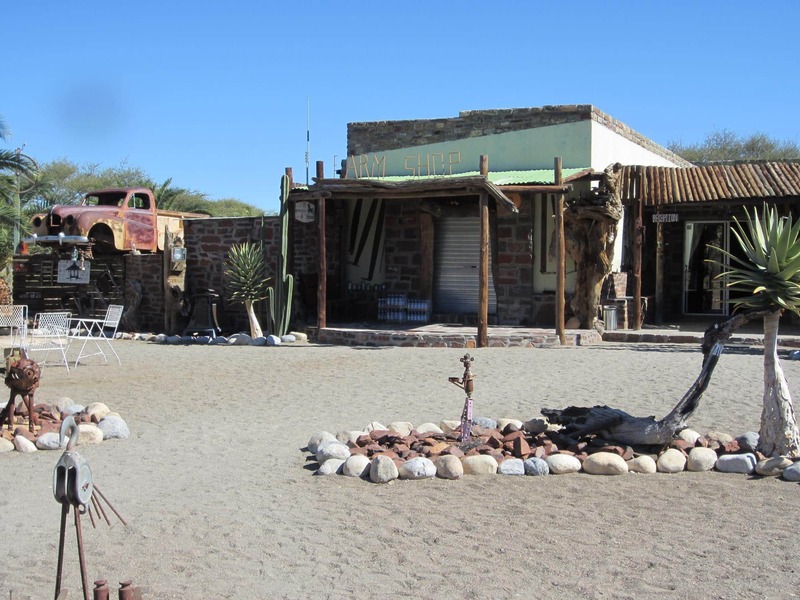 People who enjoy memorabilia will relish in a visit to Tsauchab River Camp. The reception area is decorated with old tools and implements as well as collector’s items from their family. They even have the old chairs of the Solitaire church as part of their furniture! 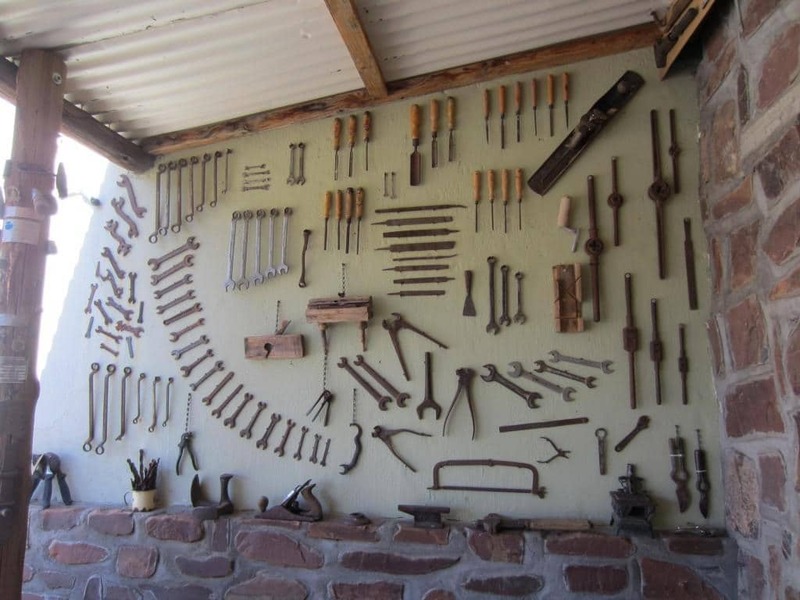 One of the walls is decorated with old tools.